A few weeks ago, I made Chocolate Coca Cola bottle as a Piñata. I decided to make a smaller version which is the size of a 20 ounce coca cola bottle. This size coca cola bottle is perfect for tiny size candies such as mini M&M’s, Skittles or even small jelly beans. I think it would fun to serve at any party..birthdays, family gathering or even as a prank especially since this is something not a lot of people have not seen it in person. This will definitely be a topic of discussion at any party! Below are the ingredients. It is pretty easy to do. You just have to be sure that you make the chocolate thick enough. Otherwise, the chocolate can break when unmolding it from the plastic. Below see my recipe video. 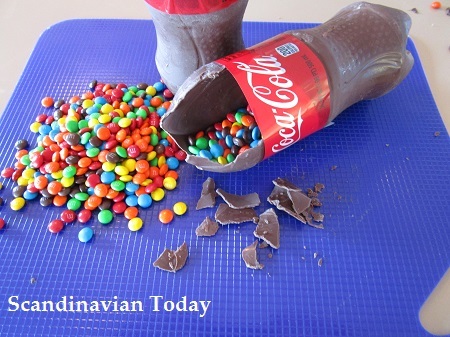 You will want to melt the candy chocolate, pour it into the plastic bottle and let the chocolate to become hard. You should try to do this at least 3 or 4 more times because you want to be sure that the chocolate is nice and thick. Otherwise the chocolate might break as you are unmolding the chocolate. See my video as an example of how fragile the chocolate can be. Once you make it you can either break it part to get the candy or pour it out of the chocolate bottle. Have fun! Chocolate Coca Cola bottles made out of chocolate seems to be the rage right now. So I thought to do a fun spin to have a coca cola bottle shape, made out of chocolate and use it as a piñata. 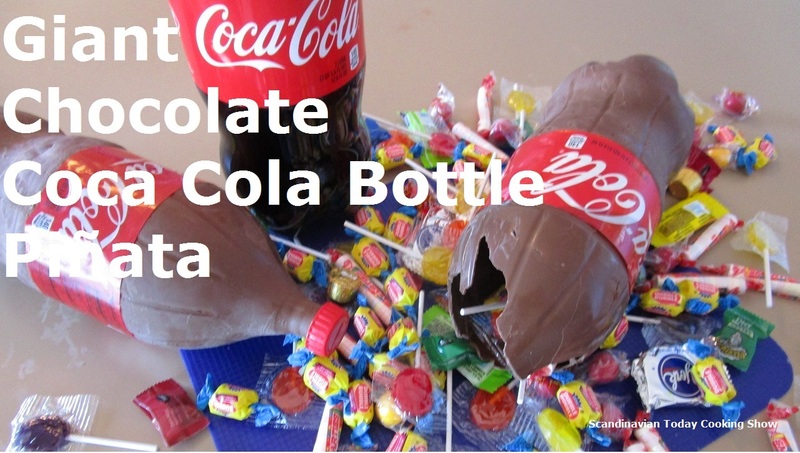 A 2 liter coca cola bottle is perfect for any size candy that you want to use from candy bars, to lollipops to Twizzlers! I think it would fun to serve at any party..birthdays, graduation parties or even a family gathering such as picnics or barbecues. Since giant chocolate cola bottles is a new idea or at least it is not something a lot of people have not seen in person, a giant coca cola bottle made out of chocolate will definitely be a topic of discussion at any party! Plus everyone loves piñatas. Trying to see what kind of candies or goodies are inside! Piñatas is a fun to have a party too!